Welcome to Pawlovich Chiropractic. Our team is here to help! 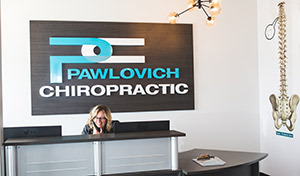 At Pawlovich Chiropractic we take pride in offering a patient-centred experience. Hopefully, you will enjoy our friendly environment where your visits should be relaxing and stress-free! Here is a description of what you can expect on each visit with us. To prepare for your initial visit with us, you may fill out the online intake form or you can fill out the form in the office at your appointment. We will do a full assessment on your condition to get as much information about your current health challenge and past history as we can. You can expect to be with us from 30-60 minutes for this appointment. We ask that you wear comfortable clothing to your appointment so that you are able to move around easily. Dr. Pawlovich will also go over his recommended care plan for you and likely give you your first chiropractic adjustment on this visit. Nothing will be performed without receiving your informed consent and we encourage you to ask many questions. We will also review all financial information with you on your first visit. We aim to be respectful of your time. Since we will have gathered all of the information at your initial visit, subsequent visits are much shorter in duration….but very important. Each visit in a series builds on the last one. Each of your following visits should take less than 15 minutes. Dr. Pawlovich adjusting a child patient. Many people have the impression that if you start going to a chiropractor you have to continue going forever. At Pawlovich Chiropractic, we emphasize that you always have a choice. Many patients choose to get regular chiropractic care and others choose to use chiropractic to deal with an immediate problem. Dr. Pawlovich will provide his best recommendations that are in your best interests. Ultimately, the decision will be yours. Chiropractic has been shown to be part of a healthy lifestyle, much like exercising or eating healthy. Many people experience great results from chiropractic and choose to continue it as part of their health strategy. Still have questions? Give us a call at (306) 244-7080. We welcome the opportunity to discuss your concerns!